Upcoming retro horror short that I’m shooting/editing, directed by Cameron Holly Dexter. Stay tuned as new details emerge. Simulated timelapse in “Only the Moon Saw It”, directed by Cheryl Leung. An empathetic piece reminding us not to neglect the elderly people in our lives. Wrapped a cute little short called “The Yule Doll” coming out sometime next Christmas. Directed by Eris Zhao. Pre-visualization is an incredibly useful process beginning at the time a client or show starts talking with me about the challenges of a particular shot. In this case, Watson Creative contacted me about shooting bowlers on Plexiglass for a billboard, and I needed to develop the lighting plan and address some of the issues with reflections that might come up. Because Watson Creative is a design and brand studio located in Portland Oregon, I couldn’t be in person for the tech scout. Using the known space limitations of the location, I estimated the size of scaffolding needed to perform the shoot and got ahead of some of the issues that might have popped up on set. The real life lighting set-up changed once I started sculpting with our models in the individual poses we eventually went with, but using CGI as a pre-visualization tool, I could make a fairly accurate guess on how high the scaffolding should be, how large of a ceiling backdrop was needed, and the focal length we would need to use. Comparing the two versions, the main thing that changed once we were on location was the color temperature that the DP requested. We swapped out some units and did a little re positioning. We eventually killed the Jem Ball as well, once we saw blocking. The car door killed any chance of doing top-light. I think we went with a bounce using our open faced lights. Little engagement video I shot for my friends Erin and Fritz. Fitness clothing and material ad commissioned by Watson Creative, based in Portland Oregon. This video comes courtesy of my friend Ian McCausland over at Abelcine in Burbank. Ian and I work together during RED's educational classes and asked if I would talk a little bit about using the Skypanel on set. 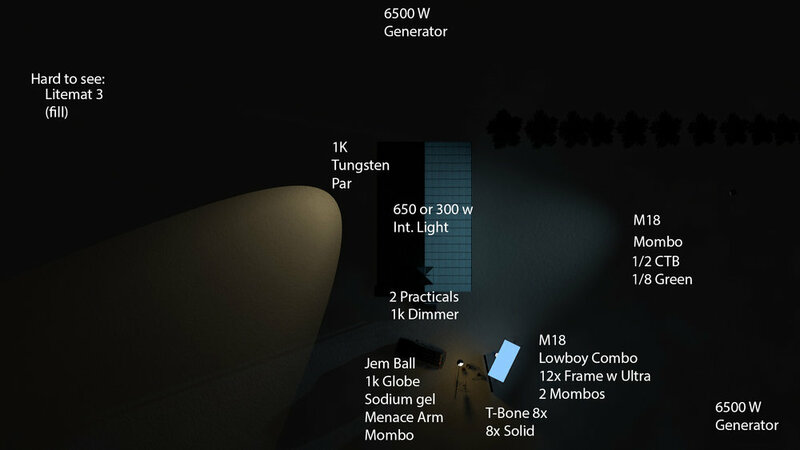 I'm a huge fan of this lighting tool and worked with it on a number of shoots as an electrician, gaffer and DP. In the lighting department, being able to cue an entire inventory of gels at the touch of a dial saves so much time when you need to change color on the fly. Look for my ugly mug at the 6:44 mark. Thanks again to my friend Ian for featuring me on Abel's blog and take a look at his full breakdown here: At the Bench: Arri Skypanel S60-C. This little test comes from our three day REDucation class at Thunder Studios in Long Beach. We shot this footage at 6k 2:1 on a Monochrome Dragon with the Kipper Tie Full Spectrum OLPF at 2000 ISO to see infrared on skin. Typically infrared is used in landscape and nature photography, but I was interested in what it would do to the human face. We were all surprised at how few pores were discernible when applying tungsten light to skin. Typically, reducing skin texture is something you would have to do through through filtration, post production or heavily diffused lighting. In this case, it came ready-made. I particularly love the way that the skin glows under light and the eyes go dark. It's a built in vampire filter. Director of Photography and REDucation instructor, Patrick Lawler. You can see the skin softening effect much more clearly in the image above. No softening or healing has been done in post to reduce skin texture. Technical Director of Kipper Tie, designer of the Full Spectrum OLPF, and lead REDucation instructor, John Marchant. In this image, John is firing a TV remote controller at the lens. The light would usually be invisible, but can be seen in camera, pulsing like a strobe. I've been working with RED Digital Cinema as a freelance gaffer and cinematographer for about two years now, and love teaching at REDucation LA. The class is three days of color science, camera tests, and hands on instruction using some of RED's newest and coolest toys. We were unusually spoiled this time around, getting a sneak preview of RED's latest body and sensor. Thanks to Jarred Land and John Marchant, we got our hands on the unreleased Forged Carbon Fiber Weapon. We were amazed at it's incredibly clean ISO's above 2000, which has previously been an issue on models past, and loved the ergonomics of the body. I couldn't believe how light the camera was the first time I picked it up. We were also fortunate enough to have one of Dedolight's representatives, Roman Zenz, furnish us with an array of wonderful lighting instruments. Not wanting the gear windfall to go overlooked, I shot this quick portrait of Ricky Lesser using two of Dedolight's octadomes and one bicolored LED focusing unit. The key light is Dedo's largest octa unit and contains two 400w HMI's which can be re-struck with no waiting period. The fill light is their medium 5 ft. octa using a single 400w HMI. I loved the quality of light from these soft-boxes. The inner diffusion layer has a thicker circular piece of fabric in the center of the cloth that eliminates the typical specular highlight that occurs when pointing any light directly at the subject. The image was captured at 320 ISO, lifted to 400, and graded and sharpened in Photoshop. I purchased four Rokinon Xeens with PL Mounts ( 24, 35, 50, 85 mm) from Duclos Lenses last year and tested them by doing a little glamour shoot with my friend Patrick Lawler, an incredibly talented Director and DP. We were both happy with the image quality out of camera. They tend to be fairly warm in color, which I found pleasing for skin tones. The image quality was softer than I expected, but I found it to be quite forgiving when photographing faces. The build quality, weight and focus gear are surprisingly good, especially at a price point of $2,499 per lens. I recommend them to anyone looking to step up their lens game without breaking the bank. Photo/video shoot on RED Dragon for Maria Dora's 2015 summer knitwear catalog. Maria creates surreal pieces of knitwear featured in a number of film and television shows, one of her most well known pieces is the cowel Jennifer Lawrence wears in The Hunger Games. Hard to believe it's been three and a half years since I packed my things and headed to Los Angeles to enroll in a six month film class from RED Digital Cinema, a company that has continued killing it in high resolution motion picture imaging. During my time there, I met professional colorists, editors, directors, cinematographers, gaffers, and engineers who all taught me valuable lessons about the filmmaking process. During the class, I had the opportunity to work on 5 short films in less than three months and direct one of those five. It certainly was a baptism by fire. Location problems, logistics issues, fire marshals. The list goes on. But out of all the chaos emerged a film. My first short, A Fistful of Feathers, is a love letter to the Spaghetti Western films my father and I used to watch together when I was a a kid. It was featured on Film Shortage and screened at the Mill Valley Film Festival in San Francisco when it became a finalist in Sharp's Amazing Art of 4k contest. Chase is an 8-year-old obsessed with cowboy films. After his parents kick him out for watching too much TV, he must confront two ravens that cross the line. Click the poster to see the film. A few personal images from my father-son road trip to Yosemite shot on the old iPhone. My dad introduced me to photography and was the first person to help me begin that process of "seeing" that photographers and cinematographers always talk about. Not accepting your first impression of reality, but reimagining it, visualizing what it could be, and then making it happen. Ideas have a way of growing once they are planted. After a long and protracted battle with wordpress, I finally made the jump to squarespace. And was it ever worth it. Mobile galleries should be looking much nicer for you folks who suffered through my last website. Cheers to technology. Ain't love grand?